iParts are method of creating Library Contents for similar parts. When you create an iPart, a table is placed in the part, that will contain the individual members of the library. These members are contained in rows of the table, with the key differences edited for each member. The table contains various fields that represent the parameters that shape the iPart members. The iPart members can have identical values as needed, with the exception of 2 fields. The Part Number and Member name. A lot of care should be taken in planning the Part Number and Member names, as the future file name of library contents is tied to the Member Name, and the Part Number gets fed into the BOM. However, the Content Center Editor can apply variables from the table to concatenate a Part Number automatically, which we WILL do later. For now, we will prepare the table in the following fashion. Under the Tools Menu, select Create iPart. 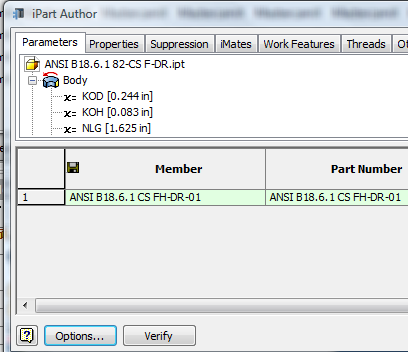 The iPart Author dialog will appear, revealing the structure and rows that will appear in the iPart table. Currently there is only 1 row in the iPart table, seen at the bottom of the dialog. This row is fed from the current parameters contained in the part. At the bottom of the table you should see an Options… button. Select it. I have no desire to fight with the Member field as it increments, and Part Number as well. I am going to use the Content Center to care for my naming conventions immediately after publishing, so I just need a simple managed solution. This is it. Under Part Number, select the radio button next to ‘Set to Value’. Enter the following string: ‘ANSI B18.6.1 CS FH-DR’. 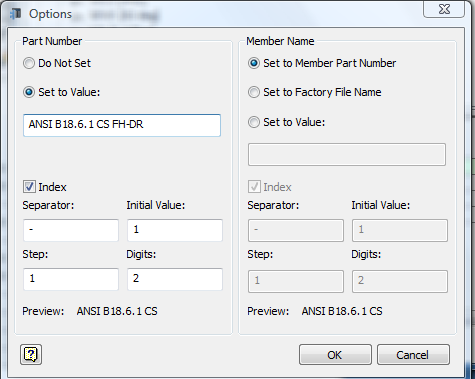 Under Member Name, select the radio button for ‘Set to Member Part Number’. Pick OK.
You should notice that the Member Name and Part Numbers are representative of what we indicated in the dialog. We need more members in the list, but before I add them, I need to add some columns for authoring. Notice the table section below. Notice in YOUR table, the right side of the columns ends at BDM. There you should also see the 2 User Parameters you added in the previous steps. There are 4 more designations we need to author this part. Those are the SIZE_SEL, TS, THREAD: DESIGNATION, and the THREAD: CLASS. Proceed to the Threads Tab, and review the 2 panes. On the left is the Thread data being stored in the part, and on the right is the data in the iPart table. Yours iPart pane will be blank. Select the Thread:Designation, and pick the add to table right chevron button. The Thread:Designation should show up in the right pane. Repeat the process for the Thread:Class as well. Now we need 2 columns for Screw information that isn’t passed down to the fastener from the sample’s Content Center Family. Proceed to the Other Tab, and add TS (Thread Series) and SIZE_SEL (nomenclature). These will add in as iPart table columns, having New Item() as the data. 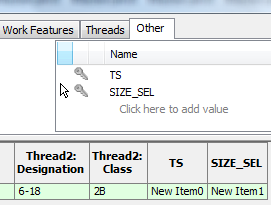 SIZE_SEL should be changed to #6, and TS should be changed to INCH. It is a good time to save. Close the iPart table and save the part. Reopen the table by right clicking on the table in the browser, and select ‘edit table’. Right Click on the iPart table row header, and select Insert Row. You should be able to see the content duplicated, except the fields that can’t be duplicates, and those with incremented values. Continue to add 3 more rows. Now that we have 4 members of the iPart, we need the member differences identified. In this case it is the length. Change the individual lengths in the NLG field for each member. The grip lengths need to be changed as well. The manufacturer’s specs show the grip at 2/3 the overall length. Now we have an iPart that contains 4 members ready to be published to the Content Center, including iMates. Various things shown above, including Part numbering and Thread designations is either for the family that the iPart is published into, or will be taken care of once the parts are in the family.